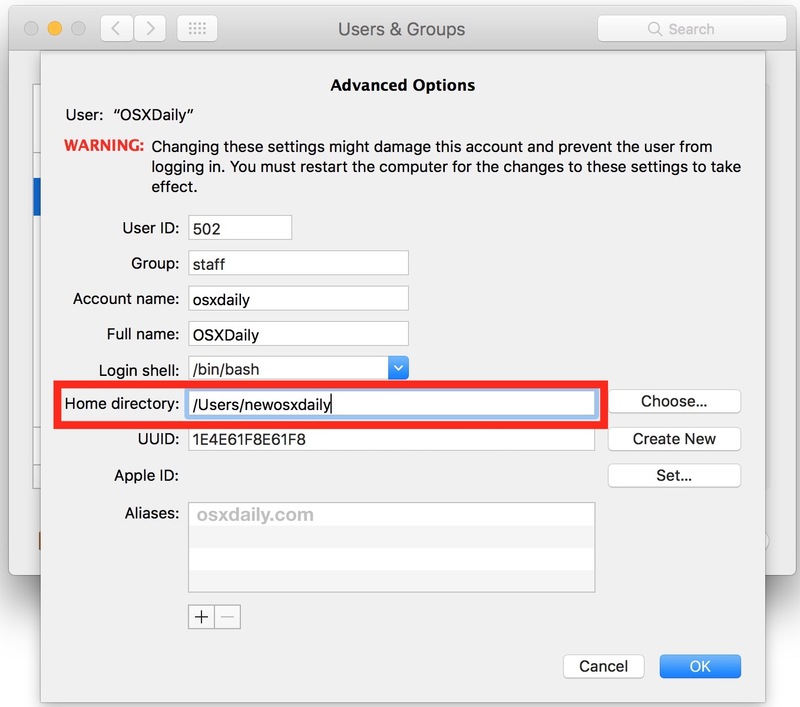 Some advanced Mac users may wish to change a users Home directory folder name. This is a fairly unusual scenario that is typically only necessary for very specific reasons, whether a new user account has been added to a Mac, accounts are being merged, a user is changing their name and adding a new user account is not possible for some reason, troubleshooting unusual conflicts with directory names, or for other specific reasons relevant only to advanced Mac users. Do not attempt to change a user home folder unless you have a compelling reason to do so and you know exactly what you’re doing and why you’re doing it. This is not an action to be taken lightly due to the potential for a myriad of things to go very wrong. This is relevant to advanced Mac users only. Warning: Back up a Mac with Time Machine or your backup method of choice before doing this. If something goes wrong, the user account could be inaccessible including any and all files, and there are other potential issues that could arise as well. 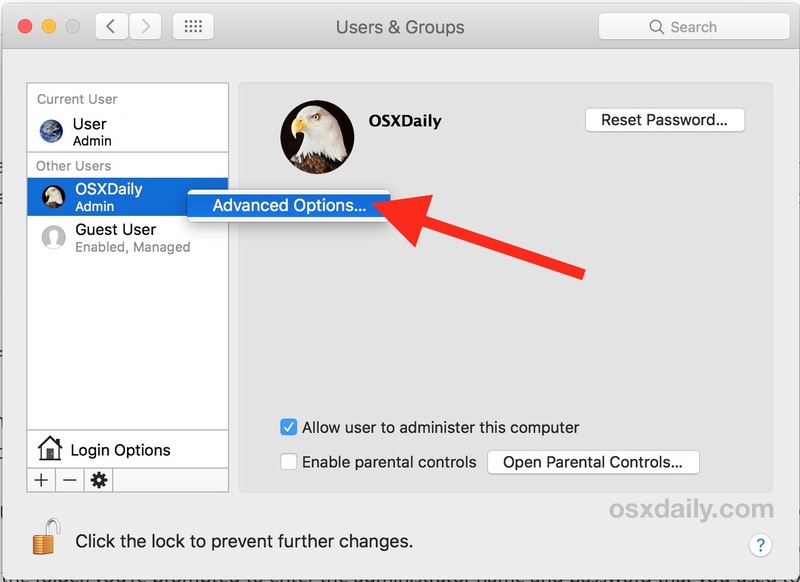 Do not skip backing up the Mac and user data before performing any of these actions. 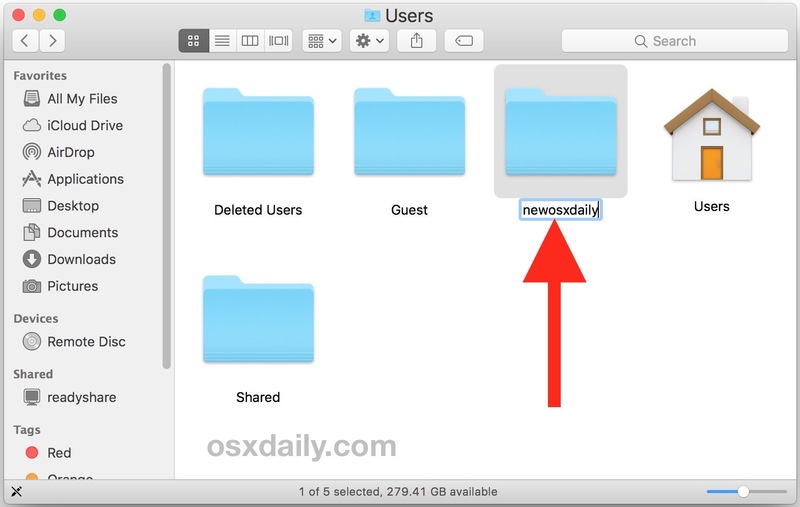 The method we’re going to show here works to change a users home folder name in Mac OS and Mac OS X, including versions Sierra, El Capitan, Yosemite, Mavericks, and Mountain Lion. It is critical to insure that everything in the changed user directory is accessible and works as intended, do not skip verifying data, files, and preferences, as things can go awry and lead to issues down the road. Note there can be some unusual side effects with doing this, including having the user account lose various customizations and settings, or sometimes even an inability to access certain files or data. 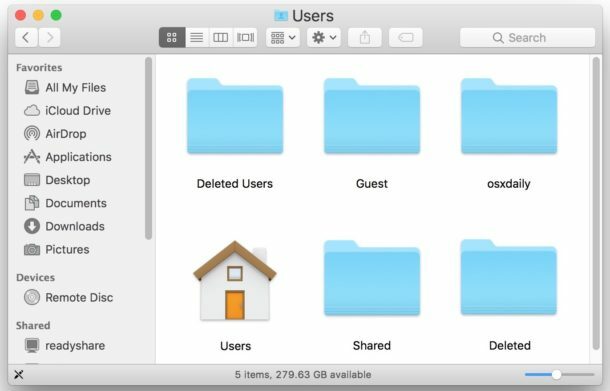 For example, you may lose all Dock and Finder settings on log out persistently, until you either fix the user library folder permissions with chown or your method of choice. Additionally, users may lose access to some files or folders if they are referencing a directory that no longer exists due to the name change. This is just a small sample of the many things that can go sideways, which further should emphasize why this is truly only relevant to advanced Mac users and not a casual undertaking. Note that we’re changing only the user folder name in this example, and not moving the location of the user home directory, which is sometimes undertaken to relocate a users files to a different hard drive or volume. The task is similar, however. I tried this very thing today, since when setting up a new Mac on Sierra, the initial user account creation wouldn’t let me use upper case for my initials. It seems weird having my home folder initials in lower case! I followed the same process (using Apple’s own kb article) but couldn’t get past Step 3 as described above. No matter what I did with folder permissions, I could never rename the user folder. It was always greyed out in Get Info, pressing Return did nothing and “Rename” never appeared on right clicking. (And yes, I had logged out of the account I wanted to change, and was logged in as an Admin on another account). Similar scenario here, I had to do this after migrating to a new Mac with Sierra where Migration Assistant doubled the users for some reason. Anyway, you have to be logged into a new and different admin account, if it’s not letting you change the name it’s probably in the same account or it does not have admin access. You can also do it at the command line from an admin account with sudo mv /Users/OldName /Users/NewName and then follow it up within the control panel so that it knows where to look in the proper place. Your home folder name will always be in lowercase… but the way your name is Displayed will be with Uppercase. Don’t try and change it, it will end in tears. There are other ways to do this… I’ve used symlinks for years to point the home directory to one on another disk – keeping user directories off root disks is unix 101 and the Mac should not do it. BTW – can the author please learn the difference between “insure” and “ensure” – sub-editors too. Be advised, DO NOT CHANGE your home folder name if you have softwares that leave their .application configuration files in the home directory, including emacs, MATLAB, etc. They are very likely to be broken after the change! Just replace “Old_Name” with “New_Name” & be sure to not include the quote marks. Now change the home directory pointer as shown in this article – this method should maintain all prefs and permissions although some apps may need their Libraries pointed to the new location if you’ve moved to another disk. It worked for me. All the way. Except that I later found out a) dropbox was confused and asked if I wanted to restore the 30.000 files I had deleted and b) after 4 weeks I discovered all my attachments in Bookends had disappeared. The entries were still there, but the attachment-folder had been replaced with a new, empty one … I lost about 250 pdf:s and the like. So – don’t unless you really, really, really have to. In Users and Groups, click the “-” to remove the user. In the dialog, choose to leave the home folder in place. Go to the Finder and rename the Home folder. Create a new user with the same name. The OS will ask if you want to use the existing folder as Home, say yes. Just ensure you close all unnecessary apps. I just did this, opened the advanced settings where you can change homefolder. Opened a terminal. changed the home folder in advanced settings and rebooted. Flawless. Was that from a different account, or from the same account you are trying to change?